This article has been held back for to long, thus I will now write it and many installments to it. I was born again in 1992 by God’s Spirit and began to attend a Pentecostal church after my conversion. I attended Pentecostal churches until October of 2008. In 2004 I came to the knowledge of Reformed Theology and began to teach and to preach, directly from the scriptures, the very word of God. My Senior Pastor asked me to leave in 2008 because he did not feel comfortable teaching his false doctrines with me present. I was called to the office and he told me that, though I was preaching the truth, nevertheless, his church was a Pentecostal church and not a Reformed church. He told me that as long as I was there that he could not teach the false doctrines of healing in the atonement, God wants us all healed, or many other false concepts that are held by Pentecostals. This much stated I will state that I do not know everything. I am not claiming a superior knowledge above and beyond Pentecostals; the same knowledge and understanding of the scriptures that I possess, they to can possess. Yet I am claiming that I have the authority to examine their claims. In other words God commands us to test all things by his word. He commands us to test prophets by his word. He commands us to test systems of doctrine by his word. He commands us to test so-called miracle claims by his word. His word is the final authority. This is where I depart from Pentecostals. This is the only place wherein I stand superior. You see Reformed Theology holds to sola scriptura or scripture alone. Experience must bow before God’s word. Feelings must bow before Gods word. Prophets and their so-called prophecies must bow before God’s holy word. Scripture and scripture alone is the final authority of faith and practice of that faith. Above when I stated that I do not claim any superior knowledge above and beyond Pentecostals, I will state that this is not true for them. They do claim to have a superior knowledge above the average churchgoer. Pentecostals believe that they have “it” and other faiths or denominations have somehow missed “it.” They are like the gnostics of old when they claim that they are in the “know” and everyone else has missed the boat. But above I stated that they claim that other faiths or denominations have somehow missed “it,” but this statement is not entirely true. It is not true in the sense that Pentecostalism is a separate faith or denomination. Certainly there are Pentecostal denominations, but today one cannot rightly identify a Pentecostal because this movement has spread out into many different denominations. In other words one does not have to go to a Pentecostal church to be a Pentecostal. Pentecostalism has spread into Methodist, Presbyterian, Baptist, and even Catholic congregations. But no matter where this movement spreads the same attitude of superiority goes with it. If you are infected by it, then you will feel that everyone else has missed something. Some would say, “But that is Old Testament, now that we are in the New Testament God has given us authority and he is waiting on us.” Okay now let’s go to the New Testament and I will quote directly from Christ Jesus. After his resurrection he stated in Matthew 28:18 “And Jesus came and spake unto them, saying, All power is given unto me in heaven and in earth.” You see this is another quality of Reformed Theology. Reformed Theologians recognize that God is absolutely sovereign in all areas of life. God is absolutely sovereign over his entire creation. The very definition of God is that he is a being that is absolutely sovereign over all his creation. To say otherwise is to claim to be an atheist. So, contrary to what Frederick Price stated, God can do what he pleases in this earthly realm. God is sovereign. He is Lord. Christ is seated at the right hand of the Father ruling and reigning over this universe. God is not limited to the will of his creatures, neither has he given away his authority. The Church as Ambassadors of Christ has the authority to speak in Christ name, but never for one moment is God limited to the will of the creature. This much stated, I will close this post by relating to you my goals for writing this material. My goal in publishing this article, first, is to bring glory to God. My second goal is to expose false teachings and to expose those who claim to be speaking for God. So I pray that you are learning from this and pray that it is a blessing to you. Come back next week for part 2. You can purchase John MacArthur’s book here. The only true Faith is the simple Belief in Forgiveness as free Gift of Grace,without Works. combined with true Fear of God where one keeps hiself free from Sin,for Forgiveness is pointless without Holiness. The Pentecostals say they believe in Grace,but their Actions are the exact Opposite,they think with much praising God they can. become “stronger” or obtain “more” of God’s Spirit,but God’s Spirit is the Spirit of Jesus Christ and is a Person and you either have this Spirit or you have it not. Read Luke 11:13 “give good Gifts to your Children” Here is the Question “are you God’s Child? Everyone who has believed in Justification oF Grace,without Works is God’s Child through Faith and has 100% God’s Spirit. But the Spirit of Pentecostlsm is a Spirit of being “righteous” through Works and this is not Gods Spirit.Also Tongue was never a “Secret intercessory Prayer” or a Double Dutch,but a prophetic Message in a true Tongue of one of the peoples of this World,sometimes a Person was present that had the Tongue as Morhertongue or sometimes not. Amen. Pentecostals are children of a heretical sect known as Montanism. Not only (neo) Montanism, but semi-Pellagianism and kenosis as well i.e. they are non-Christians! Thank you for your comment, friend. I would agree that the belief systems that you listed are a serious distortion of Biblical truth. I used to be captive to these systems, but new that I was born again. The Holy Spirit opened my eyes through serious study and I came out of those belief systems. I would contend that once a person has been brought to the knowledge of these beliefs and then refuses truth, then that person isn’t a consistent Christian or they are no Christian at all. The bible warns against false teaching and emphasises sound doctrine, and God had a very simple reason for weaving this message through the epistles and that is: He wants us to mature. The fundamental issue with the pentecostal opposes this. It is impossible for pentecostal’s to mature in Christ because they fundamentally reject the true Gospel, salvation by Grace. Pentecostals give Grace lip service, but deep down they believe that “they” must maintain their salvation, it is a gospel of works and this is the key to understanding their falsity although it is well hidden but evident if you care to look. Their cornerstone is not Christ but the individual. Vipers, who capture souls with their charm and make them twice the son’s of hell that they are, laying burdens on people. Pentecostalism is the most incidious form of false Gospels. It is a masterpiece of “the wolf in sheep’s clothing”. It’s members are convinced and yet deluded and this is evident in their fake behaviour. There are many “instead of Christ” religions in the world but this one is deceives in a wonderful way. Thanks for your comment friend. I totally agree with it and wish pentecostals could see the truth within what you’ve stated. You seem to have instigated a bit of misguided “Pentecostal-bashing”! To begin, the doctrine of “Healing Through the Atonement” is not a “Pentecostal” doctrine. It was originated by a Baptist minister by the name of A.J. Gordon in his 1882 classic book (I forget its name). The doctrine was commonly asserted within the Healing Movement of the 1880’s & 90’s as an encouragement to sick believers to “believe” for their healing. When Pentecost arrived in the very early 20th century, many Pentecostals accepted the teaching given the holiness-roots than many shared in Wesleyan Methodism. But it was never a “Pentecostal” doctrine & was controversial even within Pentecostalism. It was a Pentecostal that ultimately REJECTED the essential Pentecostal teaching of “Initial Evidence” (F.F. Bosworth) that tenaciously ran with the “Healing Through the Atonement” doctrine & contributed to its flourishing in the Latter Rain & Charismatic Movements. You quote Frederick Price who I would not classify “Pentecostal” in his doctrine, but rather as “Charismatic”. I know that you use the term “Pentecostal” loosely, but see what has occurred! A very unfair and damaging disparaging of a genuine movement of God. I thank you for your comment friend. Nevertheless, it doesn’t really matter where “Healing in the Atonement” doctrine began. Pentecostal/ Charismatics or whatever title you want to aplly to them have moved this doctrine over into their belief systems. Also, even though Fred Price and men like him may not identify themselves as Pentecostal, nonetheless they have taken up the doctrines of the charismatics. One cannot rightly call Pentecostalism or Charismatic faith a denomination. This erroneous movement has exploded and rolled over into all the denominations listed underneath the title of Christianity. The main move behind it, however is to unify every one underneath a single sytem that is based primarily on feeling and emotions, instead of doctrine. It is leading back to Rome and a Papal authority. Now I have not attributed anything to anyone incorrectly. I was Charismatic slash Pentecostal for over 16 years. I have been a member of or attended, the Assembly of God, Church of God, Jesus onlys and all types of independent churches titling themselves as Pentecostal/ Charismatics. I have evangelized, preached, Pastored, and taught in a heap of Pentecostal/ Chartismatic churches. They all, everyone of them taught the doctrines of which I spoke of in my blog. Matter fact, I debated many in these movements on this doctrine. Again thank you for your comment. Under your present mind-set, I fear you would have walked into the church of Cornith and condemned as well them along with the false teachers & apostles of which Paul complained. While it is fine and noble to castigate the tares be sure you do not set your ministry against the wheat. I am sorry your eyes are so blinded that you have been deceived by the modern day Montanist. Maybe a refresher course in history might open your eyes to see that the same errors among Pentecostal/ Charismatics have been condemned in the church beginning with Paul’s rebuke of Corinth. I however, see that you want to state that I would have condemned the Corinthians based upon modern errors. Not so. You really shouldnt comment unless you read all of what I have written concerning Paul’s condemnation of Corinth. Paul’s entire letter to Corinth was a condemnation of the errors at Corinth, not a.commending or approval of what they taught. Again I have been among your kind for 16 years and heard your.false prophecies and your so-called speaking for the Lord speeches. God has in these last days spoken to us by his Son and had that written down for our admonition. We do not need modern day forth tellers. God’s word is finished. A good course in hermenutics might aide you in your study of it. I also see that you are of the Weslyan Arminian persuasion. Well you are certainly at home with your doctrines. Wesley developed his doctrines of perfectionism and also out of him came the whole holiness movement. The problem was that Wesley set himself against the whole reformation in his theology. He was pleaded with to repent and to come back to the truth. I agree. Many Pentecostals do err in saying that man isnt saved until he receives the Spirit baptism and the evidence of it, by speaking on tongues. Reformed believers, such as myself, believe that one can’t even accept Christ; unless he is first regenerated by the Spirit. This is because he is dead to the things of God. Therefore, if one is quickened by the Spirit and birthed into the kingdom, then he will have the Spirit. He doesn’t need to speak in a tongue to receive the Spirit; for if he hasn’t the Holy Spirit, then he hasn’t been regenerated. Finally speaking in tongues went out with the early church. It was a gift of speaking in other languages in order to proclaim the gospel. Wow it seems like this post is your popular one…or shall I also say unpopular one as well. I have been commenting on a friends blog the past day or so. This friend wrote about going to one of their friend’s funeral service. Their friend was a Roman Catholic. So my friend wrote about being ready to flee the RC Church in the event something weird began to take place. Yet it never did and therefore my friend admitted that he felt as if he were among bretheren at the RC funeral. My objection to that is that we are never to base our doctrines on subjective feelings, but instead should base them on the objective truths of God’s word. Paul the apostle even admitted that he, at times, was among false bretheren unawares. Therefore seeing that so many have been lead to walk by what they feel, instead of by the.commands of God, no wonder this article has generated so much controversy. I have lived the Pentecostal life for some years. Never have I heard a doctrine taught or preached to the effect that one must speak in tongues to be saved. Cite your sources and we can have meaningful discussion. Then I dare say that you have not been among many charismatic/pentecostals. Most black folks that are pentecostal, Jesus only’s, teach and preach this all the time. When I first got saved, I visited a oneness black congregation and they put me in a chair in front of the congregation and told me that I wasn’t saved unless I spoke in tongues and that the whole congregation would tarry with me. Since then I have spoken with various black ministers who hold to a ‘oneness’ or Jesus only view of the Trinune God. They have told me face to face that an individual is not born again until one speaks in tongues. Now if you do more research we might could have a meaningful discussion. You can chew on this link. Also I will plainly state that unless you can point to one individual today that is using the gifts of healing and miracles, as Jesus and the apostles did by raising the dead, healing the lame, blind, deaf, etc…..; instead of back pain and head pain, then we can’t have meaningful discussion. I checked the link and read your experience. I did not have Oneness Pentecostalism in mind and am not personally aware of what they teach beyond their chief doctrine. But aside from the Oneness people, classic Pentecostal doctrine and the statements of faith for the major (non-Oneness) Pentecostal denominations such as Assemblies of God, Open Bible, Foursquare, etc. do not make the baptism (or tongues) a condition of salvation. Paul is clear that salvation is a matter of a true heart’s confession (Rom. 10:9). Christ speaks of many entering into eternal life on the basis of merely how they treated the least of His brethren. (Matt 25:40) Therefore simple kindness to those beginning to bear the image of God through sanctification may constitute salvation. That this or that Pentecostal sect may say otherwise is no reason to censure Pentecostal experience or beliefs generally. We are in total agreement, except for the statement that some will enter eternal life based upon how they treated Christ brethren. They treated them good because they were born again and had faith. No man is justified by his own works. It is faith in Christ work, on our behalf, that justifies. This faith only comes to an individual through regeneration by the Spirit of God. Natural men have not faith. Those whom God has chosen unto salvation are regenerated by the Spirit and given the gift of faith. Also my article is not on salvation, comes through speaking in tongues, as taught by some Pentecostal sects. This topic got started in the comment section. Next I would not censure Pentecostal beliefs because of what one sect erred in concerning certain essential truths of the Christian faith. I mean if I were going to censure the Assemblies of God, Foursquare, etc… based on what someone taught I would do it based upon the errors of the founding fathers who began these movements and denominations. Their doctrines are enough to reject the whole system called Pentecostalism. Finally I reject Pentecostalism because it doesn’t agree with scripture. Pentecostals teach that God still speaks through them. If this is true and God is still speaking, then we need to be recording it because it is scripture. You see, I believe the canon is closed. I hold to sola scriptura or scripture alone. The writer of the book of Hebrews is plain that God used to speak through prophets, but has in these last days spoken to us by his Son. The days of prophecies and prophets have ceased. If we are going to hear God, then we must hear what he has said through his holy word and especially what he made known to us through his Son Christ Jesus. By reference to Matt. 25:40 my intention was not to raise an alternative to faith as the basis for redemption. My point was that our objective behavior speaks louder than our doctrinal profession. Kindness, temperance, patience, etc.particularly in those things dear to God (such as what the Lord describes in that verse) demonstrate the works of Abraham that God counts as faith. A corollary would be Matt. 12:37; “. . by thy words thou shalt be justified, and by thy words thou shalt be condemned.” The centurion’s faith was saving as was the thief on the cross even though they had no doctrinal system behind their apprehension of God manifested in Christ. I agree to that and thanks for clarification. 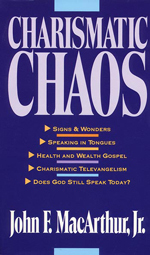 I have that book and it was instrumental to my understanding when I was still in Pentecostalism. Thanks for the follow, just followed back. Thank you for the comment. You are correct. This is one excellent book, in that it looks at the Charismatic movement through the lens of scripture. “One must rightly interpret the scriptures and to hold them above experience.” Apparently you do not believe we have a living, loving God who wants a PERSONAL relationship with us. You are putting God in a box. You are saying He cannot communicate with us. If that is so then why send us “the Helper”….the Holy Spirit you talk so much about? Thank you for visiting my blog and commenting on my post. On the contrary, I do believe that God wants a personal relationship with those for whom Christ died. Nevertheless, this personal relationship does not come to God’s elect via a mystical experience. It is true that God moves on the sinner and applies the benefits of Christ’s work to them. This is called regeneration. Yet once we are regenerate we are to know God through his word. We are never told in scripture to grow in grace and knowledge through mystical experiences, but through knowing God’s holy word. A commander of an army does not expect his men to know what he desires from them, based upon emotional feelings, but instead gives them commands, directions, and orders. Thus God’s word is what directs our paths. No, I am not putting God in a box. God himself stated through the Psalmist: Psa 119:105 Thy word is a lamp unto my feet, and a light unto my path. Psa 119:12 Blessed art thou, O LORD: teach me thy statutes. Psa 119:13 With my lips have I declared all the judgments of thy mouth. Psa 119:14 I have rejoiced in the way of thy testimonies, as much as in all riches. Psa 119:15 I will meditate in thy precepts, and have respect unto thy ways. Finally, I am not saying that God cannot communicate with us. On the contrary. God communicates with us as we meditate upon his word. Heb 1:2 Hath in these last days spoken unto us by his Son…” There is no more need for a prophet, since the Son has come. Think about this: Everything God speaks is authoritative. In other words, if God speaks to someone, then everyone ought to obey what God has said. Right? He is God. If God is still speaking, then why isn’t what he has said, being recorded as scripture? The simple fact is is that God continously spoke to men through men, until Christ came. There is no longer any reason to speak, outside his word, since the Son has come because he is greater than all the prophets. God at one time spoke through angels and their words were to be obeyed. But now we need to take more earnest heed that we obey what the Son of God said, because he is greater than the angels. God spoke this same message to us, that Christ gave us, through the apostles and God confirmed or verified what they were saying by giving them the sign gifts. The apostles received the gifts because they were writing the remaining parts of scripture. If everyone has the gifts, then how would we know who an apostles was? But Paul told the Corinthians that the signs of an apostle were manifested before them 2 Cor. 12:12. Paul was using this argument, in his letter to the Corinthians, because some false apostles had come to them, trying to deceive them with false messages. Paul used his miracles and signs as proof that he was speaking from God. These false apostles did not have these signs. The Church is built upon the foundation of the apostles and prophets. They laid the foundation and we are to build on that foundation. I hope these things help you. I too was in the Charismatic movement for 16+ years and all I saw were false healing and so-called miracles. People who were told they were healed and yet went on to die. Or those who were proclaimed to be healed were those with backaches and headaches, while those in wheel chairs, remained in wheel chairs. Christ and the apostles miracles were different. They healed people who could not walk, who could not see, who could not speak, etc….. Finally, God did send the Holy Spirit to regenerate his elect and to dwell in their hearts. But do you know why he is called the Holy Spirit? Why isn’t God called: The Holy Father or Jesus called: The Holy Christ? Certainly, they are holy. But you see the Holy Spirit is called the Holy Spirit because his title identifies him with his work. He comes to us and applies the benefits of Christ’s work to our hearts, thus regenerating us. He then works on us, making us holy as we walk through this life. He does this by applying the preached word of God to our hearts and minds and directing us, by bringing that word to remembrance when we are in life’s situations. I am a Pentecostal who is alarmed at these claims. However, these individuals do not represent the Pentecostal community as our belief system. We uphold to sola scriptura and use proper hermeneutics. I am aware that all do not, but I am also aware of Baptists and others who do not; but they do not represent the Baptist as their voice and neither do these individuals represent true Pentecostals. I commend you for standing up for truth but am disappointed you would single out individuals to represent our theology. True classical Pentecostals affirm verbal inspiration of scriptures, authority of scriptures, proper hermeneutics (critical, historical, grammatical, etc.) and we do Not perform eisegesis! May we all strive to preach truth! Thank you John for visiting and reading this blog. You state that certain individuals do not represent the community of Pentecostalism as a belief system, nevertheless, you would have to show me a creed or confession that does represent true Pentecostalism. No such creed or confession exists. I recognize that there are Baptists, Presbyterians, Episcopalians, etc…. who do not adhere to sola scriptura nor do they use proper hermeneutics. Nevertheless, as one who holds to the 1677/89 London Baptist Confession of Faith I can point to what Baptists once believed and what they have erred from. Also you mentioned that true classical Pentecostals affirm verbal inspiration of scriptures, authority of scriptures, and proper hermeneutics. Evidently you have never studied the writings of those who begun the classical Pentecostal movement. Edward Irving, John Darby, Margaret McDonald, the Plymouth Bretheren, etc… are notable names within the beginnings of what is known today as Pentecostalism. From these individuals came the doctrines known as dispensationalism, the rapture of the church, the separate plan of Israel and the church and on and on. Not to mention that today’s modern holiness movement found its beginnings within John Wesley’s arminianism. Is it any wonder that the vast majority of Charismatic/Pentecostals are Arminian? Actually, however, the Charismatic/Pentecostal movement is just an old heresy that was condemned in the second century A. D. Charismatic/Pentecostalism could rightly be called Montanism. Montanus arose in the second century claiming to have an annointing and not only an annointing, but that he was the incarnation of the Holy Ghost. He claimed that there had been a fresh outpouring of the Holy Spirit. He stressed fasting while also gathering women around him, of whom he placed in the pulpit. He claimed that there were two types of Christians-one Spirit filled, and one who wasn’t. Those who were not would be left here when Christ comes back. Does Montanism not sound like today’s Charismatic/Pentecostal doctrine? He was condemned by the early church as a heretic. How do you reconcile a closed canon with new words of prophecy? If God is still speaking audibly to congregations, through prophets, then would that not require us to write down what he says and include it in scripture? What God says is infallible and should be recorded and obeyed by all men.